Lovely green buds which open to a crisp-white colour, lightly fragrant. Wonderful in big patches. Early spring flowering, 12cm. 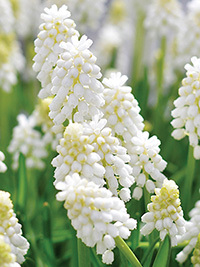 A new cultivar of white Muscari, White Magic is a strong grower.